This long weekend has not been great for choosing horror movies in the house, although I did watch my fair share. Of course, I have been stuck in a small Ancient Aliens marathon as I continue to do some research for a project, so my mind may be a touch disconnected. Next up for review here at The Ringmaster’s Realm is the 2015 low budget entry Curse of the Witching Tree. Plot/ An innocent woman, accused of murdering her son and hanged as a witch, curses a tree and the children who play around it. The effects of this act of revenge echo through the years and centuries, and restless spirits haunt the house where the bodies of the cursed children have been buried. 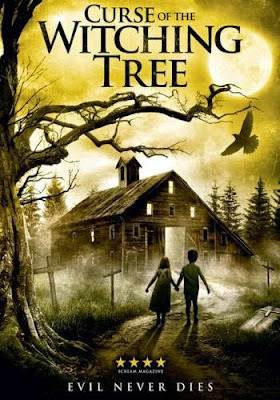 A family moves into their new home, and begin to uncover the terrible truth behind The Witching Tree and the murdered children upon which they unknowingly sleep. This has been a long week with a strange sickness taking over the house. Fortunately, as we head into the holiday weekend everyone (including me) seems to be feeling better. 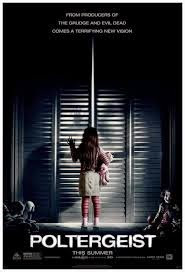 One thing that did not help though was going to see the 2015 remake of Poltergeist when it opened, as again, it shows why classic films should not be touched or remade. Plot/ A family whose suburban home is haunted by evil forces must come together to rescue their youngest daughter after the apparitions take her captive. As I continued to work on the rewrite for my short film script, I decided to get my mind clearly inside the sanitarium. I found just the flick at Family Video, when I grabbed Psychotic from 2013. Plot/ A psychologist is trapped inside a mental institution where all the patients have escaped and are on the rampage. After watching The Drownsman, I decided that I wanted to venture into something different and I found just the thing at Family Video. Besides picking up a couple of films based deep in some type of psychosis, I also picked up a great example of independent cinema. 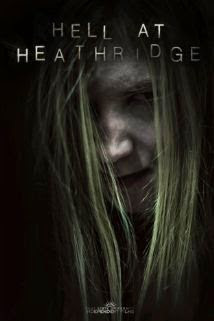 That is my next review, 2013s Hell at Heathridge. Plot/ Obsessed with obscure modern tragedies, wealthy Mr. Yates hires five college drama students to recreate a murder-suicide that occurred on their campus 20 years ago. As the actors prepare for the show of their lives, unfortunate events follow them, and by the end, they realize one thing . . . Evil is Real! Last night, I decided to take a small break from the blog as I was working on the second draft of my short film script for No Face, He Has No Face! While I was writing and editing, I did put on some horror to help keep my mind focused. 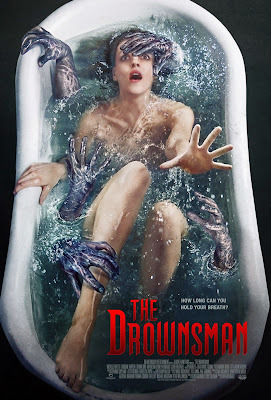 The first movie up for review from the night was the 2014 slasher The Drownsman. Plot/ After nearly drowning in a lake, Madison develops a hydrophobia that is emotionally crippling. When she begins seeing visions of an evil figure, four friends stage an intervention but accidentally open a gate to a dark place. Plot/ A group of friends on a weekend trip to a cabin in the woods find themselves terrorized by alien visitors. The weather was incredible today, as the upper 80s with humidity was replaced by a cool 73 and comfortable breeze. I was actually able to get some fishing in. Now, I have time to relax and again do some work here on the blog! 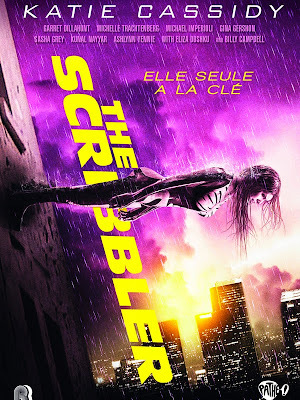 Next up for review is the 2014 Sci-Fi thriller The Scribbler. 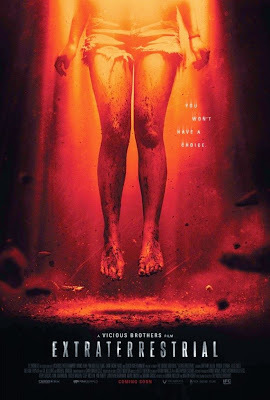 Plot/ A young woman is facing her destructive multiple personalities using an experimental new procedure known as "The Siamese Burn." I know, I know, I have again been neglecting my world here at The Ringmaster’s Realm. While I hate stepping away, there are often times where it is unavoidable. That has been the case in recent weeks, as seven straight nights of softball mixed with a major college project sucked the life out of me. Lucky for me, softball has slowed and my scriptwriting class is moving smoothly, so I am back at it. 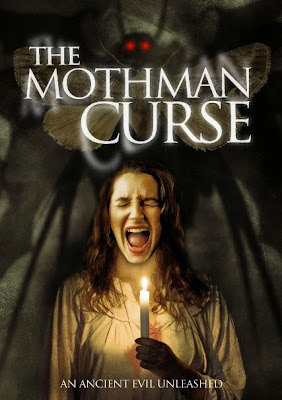 Next up for review is the 2014 micro-budget flick The Mothman Curse. Plot/ An Ancient Evil Unleashed. 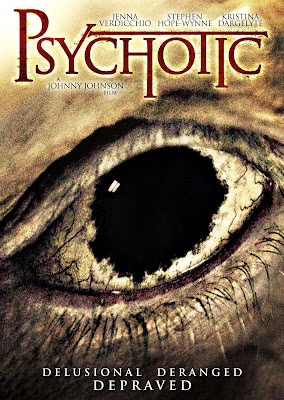 A supernatural thriller based on the terrifying legend of The Mothman. Rachel and Katy work together in a large, empty museum. 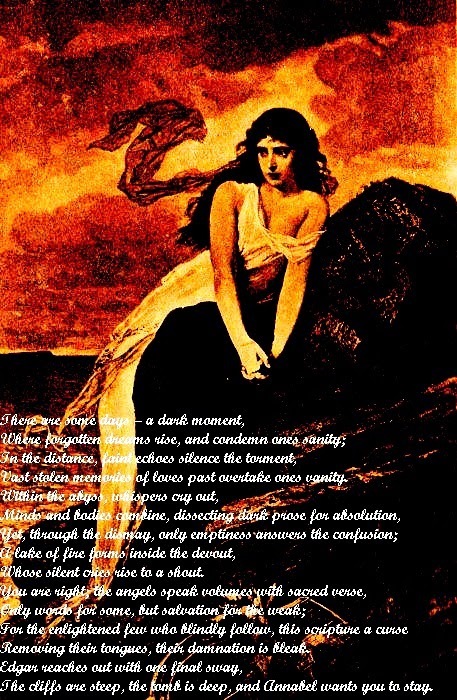 Here is another attempt at visual poetry using a stock photo, Lady By the Sea from hauntingvisionsstock.deviantar… and one of my NaPoWriMo works an Ode to Poe - Annabel (NaPoWriMo - Day 23). I was honored to have this poem be awarded the honor of best original sonnet for the fourth week of National Poetry Writing Month (NoPoWriMo). While it does sit outside the traditional sonnet format, it does match one of Edgar Allan Poe's sonnet format in one of his more famous works. With Poe being a major influence on me and my writing, this recognition means a lot to me.